How can I get code syntax highlighting in Google Docs? Is there way to switch on syntax highlighting in Google Docs? Personally I use it for editing and collaborating on C++ files, but PHP or SQL syntax highlighting also would be interesting. With the new Add-Ons for Google Drive, you can get code highlighting with the Code Pretty add-on. Lately, other alternatives have emerged, some of which have useful features. For example Code Blocks have support for different programming languages. I've found codepad.org which allows to share code snippets. It supports syntax highlighting and even compilation of code. And it supports wide range of programming languages — C, C++, D, Haskell, Lua, OCaml, PHP, Perl, Python, Ruby, Scheme, Tcl. And one more great feature — it does not require to login. You can add-on Code Block for Google Docs. EDIT: Mozilla Bespin is dead, it was merged in Cloud 9 IDE. You can make use of the the question or answer fields on Stack Exchange sites to help out. Paste your code snippet into a blank text field. Select it, and use the "code sample" (the one with curly braces) button to ensure it gets formatted as code. Wait a little while to let the syntax highlighting to do its thing. Copy the previewed question/answer code-block. In your Google Doc, on a new line, set the paragraph style to block-quote. Google Docs seems to reset the font for some reason, but preserves the syntax highlighting. Good for including code snippets into documentation. I faced this problem too, and I didn't want to add any extension to my Google Docs account. I found http://markup.su/highlighter/ , an online code syntax highlighter, you just past your code and can chose between different styles. I personally use the style "Dawn", then past the output in a tab in the doc, remove the borders and set a background to this tab. The result is good. No, there is no code highlighting natively in Google Docs. There are add ons that can do code highlighting. Code Pretty is mentioned above and has adequate reviews. Code Block is also mentioned and has good reviews. If you don't want to install add ons it gets harder. http://markup.su/highlighter/ is mentioned above as being good, and it does a pretty good job. You just have to copy and paste the code each time there is a change. If you want code formatting just for documentation purposes, these solutions will work. If you want the real time collaboration, there are much better solutions for code than Google Docs. I've found out that copying pastes from Pastebin works perfectly, and as an added bonus it adds line numbers that are recognized by Google Docs as numbered list. You go to Pastebin, create an unlisted paste (if you don't want anyone else to see it), select syntax highlighting from large number of available languages and syntaxes, hit Submit, then select and copy highlighted text into your Google Document. I tried Code Pretty recommended in here, it's OK. I wish it were open source so somebody could EASILY program in a hot-key to use like others said. Makes it very useful for the professional world, e.g., coding up how-to or wiki-like documents teaching others how to automate/code things. I tried Code Blocks instead. I like it much more. Much easier to tell code apart from the document for training or writing your own notes when learning another new language. For something simple try rextester. It allows to collaborate real-time on code snippets written in many languages. Go to 'run code', choose your language and then hit 'Live cooperation' button. This file can be opened in your browser, from where you can copy and paste the text over to Google Docs/Drive. Not the answer you're looking for? Browse other questions tagged google-docs formatting or ask your own question. 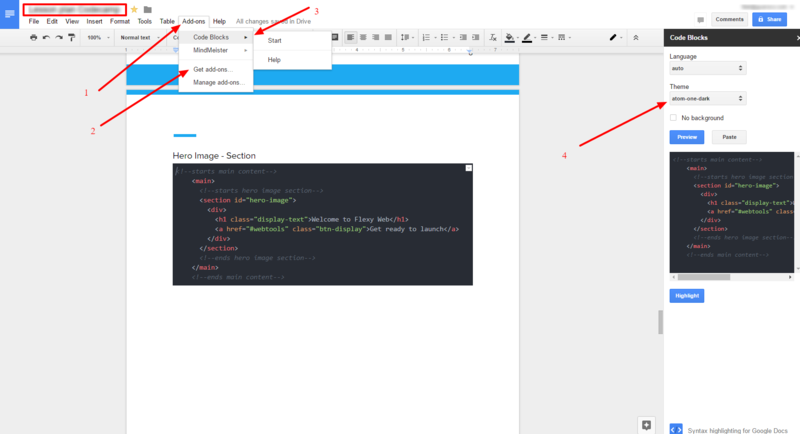 How to insert source code in Google Docs? How do I prevent Google Docs from changing (some) spaces to tabs when pasting from text editor? How do I stop Google Docs from opening documents in new tabs? How can I create custom keyboard shortcuts in Google Docs? How do you search Google Docs by date? How to make Evernote support code syntax highlight and formatting? Is there a way to make Google Docs work on desktop? What is the shortcut key to toggle between Suggesting and Editing modes in Google Docs?